A simple message: employment leads consumer credit (the bulk of which is mortgage related) - and when jobs are scarce the working population eschew borrowing. Yesterday's announcement by the Fed that it was injecting $800bn in the economy to strengthen credit markets for the consumer - home owners, students, Hummer drivers and the Holy Grail that is small business - seems to ignore this. It may, perhaps more than briefly, lower borrowing rates. That would be great for refinancing. 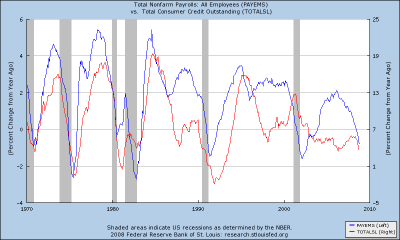 But it won't mitigate the job cycle - supply cannot in this case create demand. Unless, of course, it is given away (that Son of TARP announcement next week, maybe). As good fortune would have have it, though, President-elect Obama is on hand with the New Deal II. Fiscal stimulus plus the massive - massive - liquidity injections the US has undertaken will do the job. Of that one may have no doubts. Course, now that the US Government is in the business of holding preference shares, buying impaired credit assets, accepting the flimsiest of collateral and guaranteeing the walking-dead institutions of Fannie Mae, Freddie Mac, Ginnie Mae etc one may wonder if they are still, also, in the business of not targeting asset prices. A legitimate question, surely. Doubtful that the taking of large losses against the public purse has suddenly become politically acceptable. Which points towards any policy that increases the value of the assets underlying the People's Portfolio as a Good Thing. Even the double digit percentage increase of the national debt and risk of dollar collapse down the road.